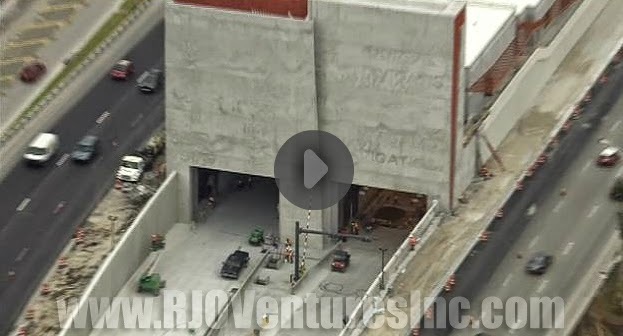 WSVN-TV - 7NEWS Miami Ft. Lauderdale News, Weather, Deco MIAMI (WSVN) -- The massive Port Miami tunnel is ready for its grand opening. Governor Rick Scott arrived in town for the ceremonial ribbon-cutting Monday morning. He announced the completion of the federal, state, local and private sector-funded project valued at $900 million, which began in late 2010. He said, "33,000 more private sector jobs when this is completed, so it's a great day for our state." The underwater tunnel that connects the MacArthur Causeway to Port Miami is just about complete. "Oh, we're very happy," said Miami Tunnel Vice President Chris Hodgkins. "We're very happy with the quality of product. We're happy with on time and on budget." Miami Mayor Tomas Regalado said, "Today is a good day for South Florida, Miami-Dade County but especially for Downtown Miami." Anyone is allowed to enter the tunnel, and the two lanes in each direction are toll free, which means there are now two ways to get to Port Miami-- the existing downtown route by Biscayne Boulevard and through the new tunnel. "This port supports over 200,000 of our residents and their families," said Miami-Dade County Mayor Carlos Gimenez. Hodgkins says the 91 surveillance cameras, 44 air quality control jet fans and the fire suppression system this tunnel will be the safest one in the world. "Oh, this is going to be a dream come true for the downtown community but also for truck drivers," said Hodgkins. The tunnel's entrance is on the eastbound side of Interstate 395, which you can access from Biscayne Boulevard or nearby Interstate 95. Though, during the ceremony, a truck drove through the tunnel, it will officially open to the public at a later date.